The name “Dana Point” is synonymous with Stand Up Paddle racing, being the home of the event that started it all, the Battle of the Paddle. 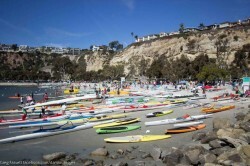 But that’s not the only race in this part of Southern California, with the Dana Point Ocean Challenge attracting hundreds of paddlers every year. The 2013 Challenge was no different, as 100x SUPs joined in with prone, surf ski and outrigger paddlers for a massive race. This event kinda slipped through the cracks last week due to our Peru hangover, but here are the results and photos from a race that saw France’s Greg Closier come away with the win. Closier was in California on a family holiday and decided to jump in the race just for fun. As one of the fastest paddlers in France (and Europe) it’s no surprise to see the Hobie team rider up there on the podium, though you’ve gotta give him extra credit for not only beating the 12’6 field, but all of the 14 footers as well.